It’s Monday, which means it’s time for another roundup of all the video game leaks and rumors that have hit the web in the past week. All kinds of exciting details of upcoming games and hardware has seeped through the cracks — and we’ve collected it all right here. So whether you’re interested in a possible Nintendo/Disney partnership, a new variation on Xbox One, or a lot more, do yourself a favor and keep on reading. Not all of these items may pan out, but many of them come on good authority. Read on for the details. 1. Is the smaller New 3DS coming to the U.S.? Ever since the big New Nintendo 3DS XL came to the U.S. in February, gamers have been wondering if the regular-sized New 3DS will ever make its way to Western shores. After all, it’s available in Australia and Japan, so why not America? An SKU is a particular model of the hardware, so if a new SKU of the 3DS might show up in the U.S., there’s a good chance it’s the standard-sized New Nintendo 3DS. Its main draw, aside from its more portable form factor, is that is has swappable faceplates, so owners can customize the look of their 3DS. 2. What’s an Xbox One Elite Console? 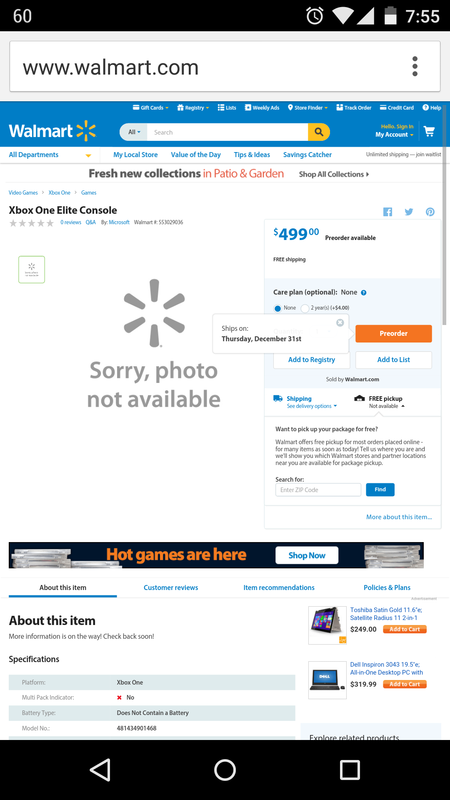 In the latest potential retailer leak, Walmart briefly posted a listing for something called an Xbox One Elite Console. The product page said it was available for preorder for $499, and set to release on “Thursday, December 31,” which was almost certainly a placeholder date. The closest thing Microsoft has announced to this is an Elite Controller, which will sell for $150 and contains a number of replaceable parts so serious gamers can customize it however they want. The Elite Controller will launch in October, so it’s conceivable that Microsoft is planning a bundle to include it. If so, Microsoft may announce the product at the Gamescom conference in August. 3. Is Dragon Quest VII coming to 3DS in the U.S.? Square Enix has been on a roll in recent years, bringing its long-running Dragon Quest series of role-playing games to mobile and handheld platforms in the West. The one game that hasn’t been given a new lease on life is Dragon Quest VII, which reportedly has such a massive script that would take a lot of work, time, and money to localize it in English. So, we have just received a cease and desist order from Square-Enix. So we are packing up shop and hoping that this means we will see a release from them in the coming months. If this is true, please consider buying the game to support Dragon Quest here in the west. It’s the only way we will see more of these game from Square-Enix. Thanks to everyone who offered a hand with the editing. While this is certainly shaky, circumstantial evidence, it could mean Square Enix is interested in re-releasing the game. That, or Square Enix’s lawyers just don’t want fans tinkering with their IP. Eurogamer reports that, prior to the launch of the Wii U, Nintendo approached Criterion Games about making a new F-Zero game for the console. The F-Zero franchise is a series of futuristic racing games from Nintendo that date back to the Super NES. Although it hasn’t gained as much traction as other Nintendo series like Mario and Zelda, F-Zero is beloved by many. Unfortunately for fans, Criterion was too busy making Need for Speed: Most Wanted to be able to devote resources to Nintendo’s racing franchise. Since we’ve heard no mention of the game since, it looks like the project never got off the ground with another developer. It’s too bad, because the Wii U can use all the games it can get. 5. Are Nintendo and Disney working on a deal? Take this one with a large grain of salt, because even if the shadowy source turns out to be correct, the deal could easily fall through before any crossover media appears.